Direct Rail Services Class 68 No. 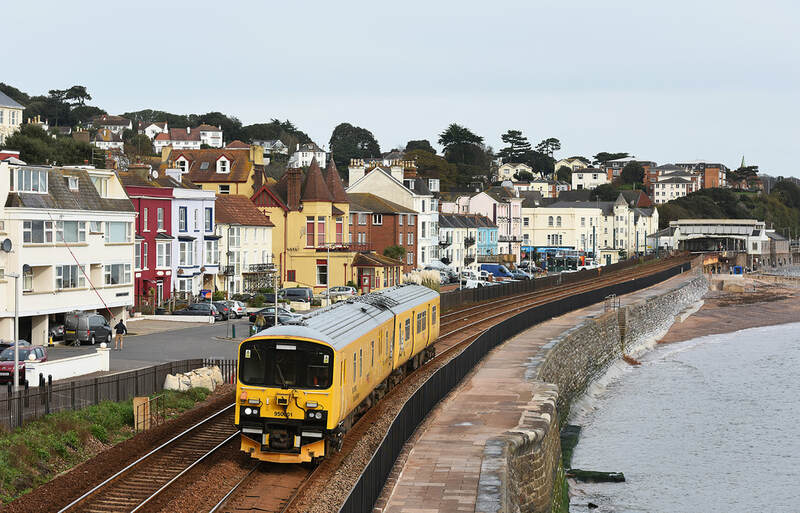 68025 'Superb' hurries along the Dawlish Sea Wall at Rockstone Bridge on 31 October 2017 powering five Mk3 coaches (12138, 12122, 10229, 12011 and 11048) previously in use with Virgin Trains West Coast and Greater Anglia, now on hire to TransPennine. The stock move operated as 5Z63, 09.52 Laira to Crewe LNW site. Noo Noo hitches a lift, Colas Rail Freight Class 66 No. 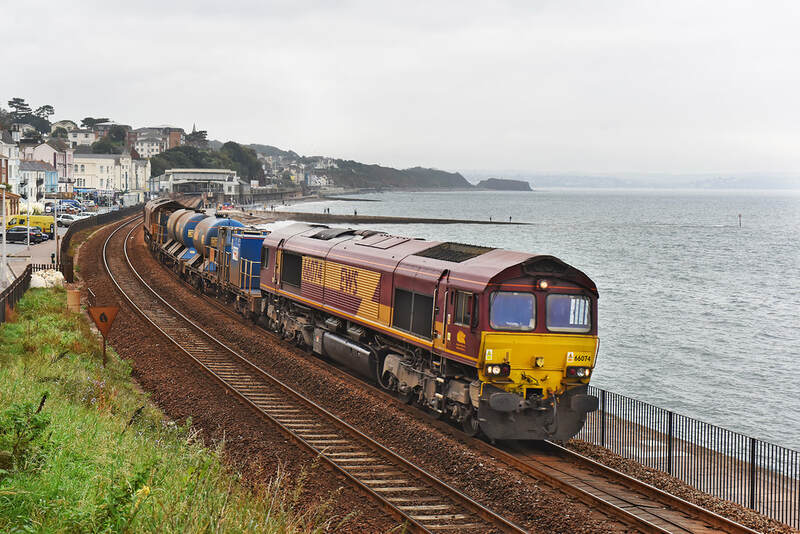 66849 approaches Kennaway Tunnel, Dawlish on 31 October 2017 leading train 6X54, the 14.50 Exeter Riverside to Tavistock Junction. The train was formed of loaded ballast wagons and the RailVac hanging on the rear. Network Rail Class 950 No. 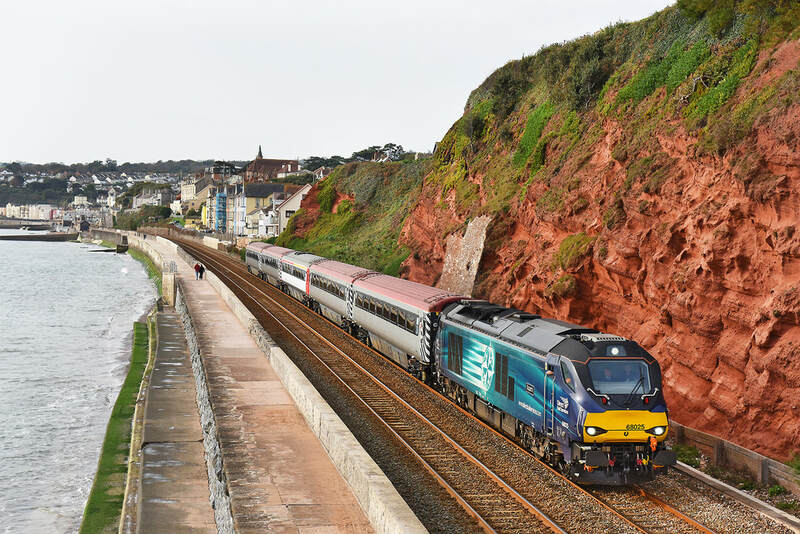 950001 heads west at Dawlish on 31 October 2017, forming train 2Q08, 04.53 Bristol Temple Meads - Laira. Direct Rail Services Class 68 No. 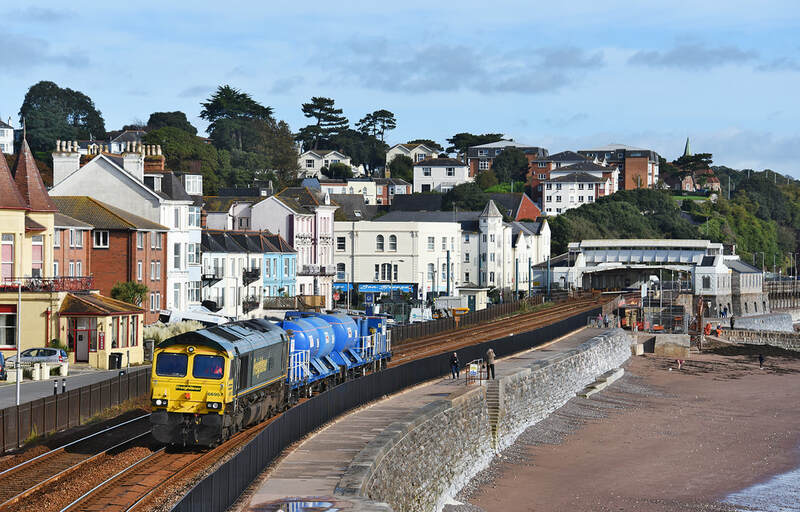 68025 down Dawlish, 0Z08 09.35 Crewe - Plymouth, 30 October 2017, loco working west to collect FTPE stock from Laira. 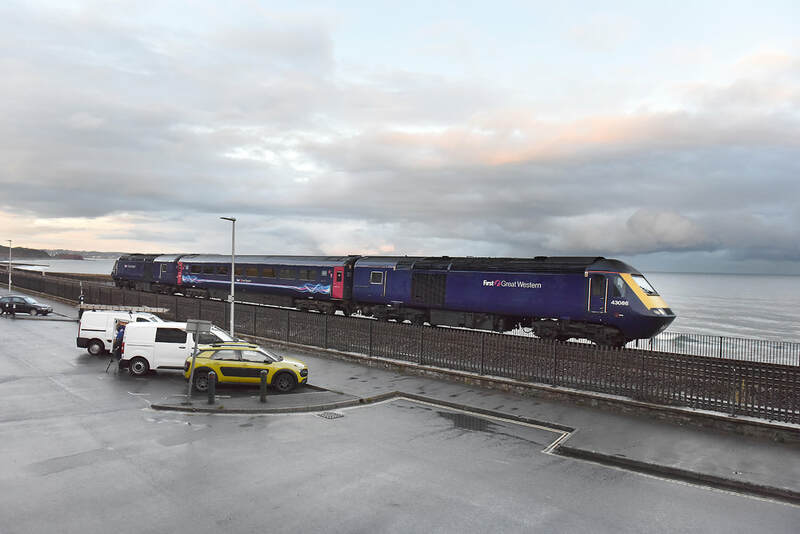 43093 "Old Oak Common HST Depot' passes Dawlish Rockstone Bridge on 28 October 2017 forming train 1A78 the 06.50 Penzance to Paddington. 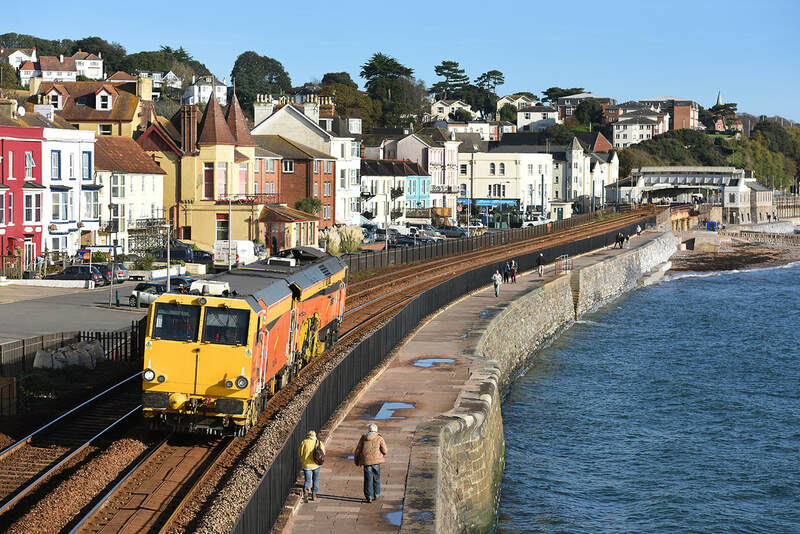 Matisa B41UE tamping machine No DR75406 owned and operated by Colas, is seen passing Dawlish on 27 October 2017 running as the 10.03 Tiverton Loop to Plymouth..
Colas Rail Freight Class 70 No. 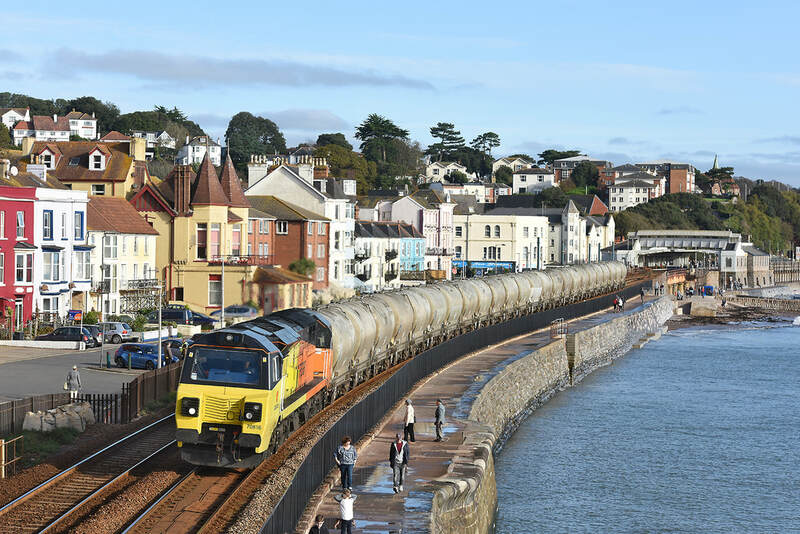 70816 passes Dawlish powering train 6C35, the 05.25 Aberthaw to Moorswater cement on 25 October 2017, the train is seen running in a slightly later path than normal and managed to run along the wall in perfect winter sun. 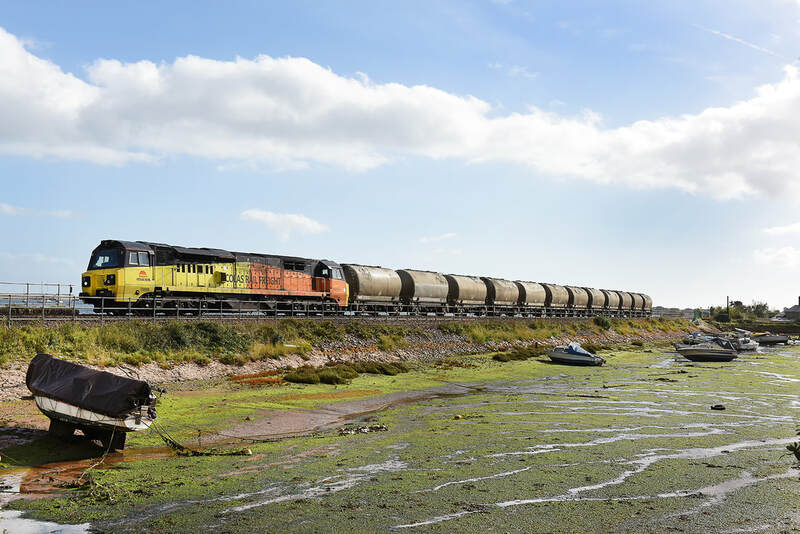 With the sun still out a rather pleasing power car move took place on 25 October 2017, 43183 and 43070 running as 0Z70, 10.48 Laira to Old Oak Common. 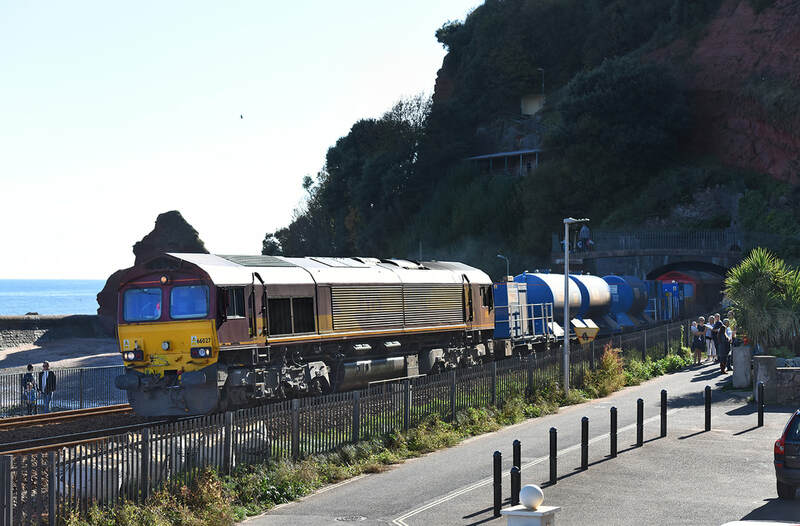 It is reported that 43070 has been out of traffic for a long time at Laira, so nice to see it return. Photographed from Rockstone Bridge. GWG green-liveried Class 158 No. 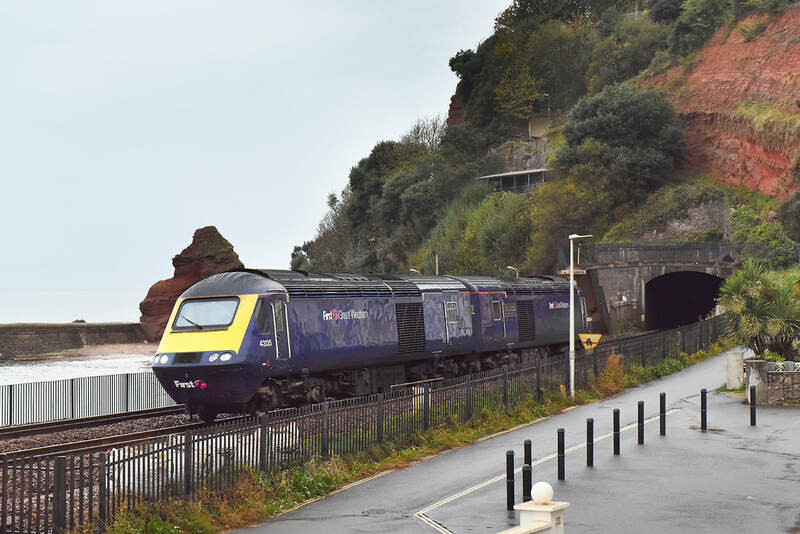 158950 emerges from Kennaway Tunnel, Dawlish on 18 October 2017 forming train 2U20, 12.48 Paignton to Cardiff. WHY do they always run these when its almost dark! 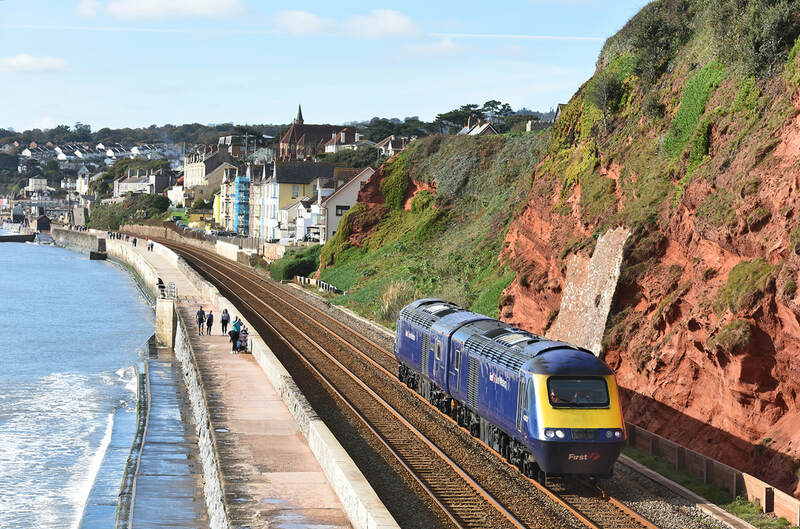 On 17 October 2017, 43135 and 43025 emerge from Kennaway Tunnel, Dawlish running as 0Z74, 16.30 Laira to Bristol SPM. Recently, we have had a huge increase in light power car moves. On the first run of the 2017 season of the St Blazey RHTT set visiting Westbury, Ying-Tong No. 66136 was removed from the train at Westbury, returning west with No. 66074 providing the west end power. On Saturday 14 October, train 3J12, the 09.07 Westbury to St Blazey via Salisbury is seen approaching Kennaway Tunnel, No. 66074 is on the front and No. 66027 on the rear. With a VERY light load on 12 October 2017, 6C36, the 11.38 Moorswater to Aberthaw, powered by Colas Rail Freight Class 70 No. 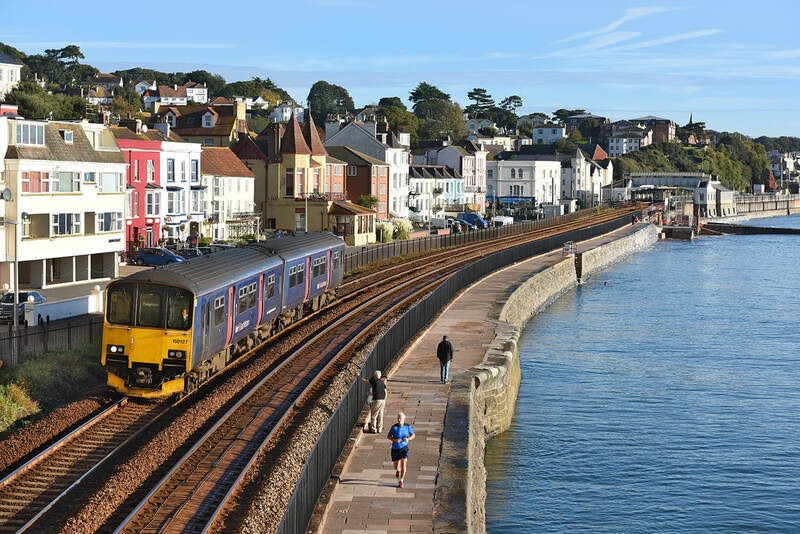 70808 crosses a very empty Cockwood Harbour in Devon. Following the up stopper it was doing about 15mph. 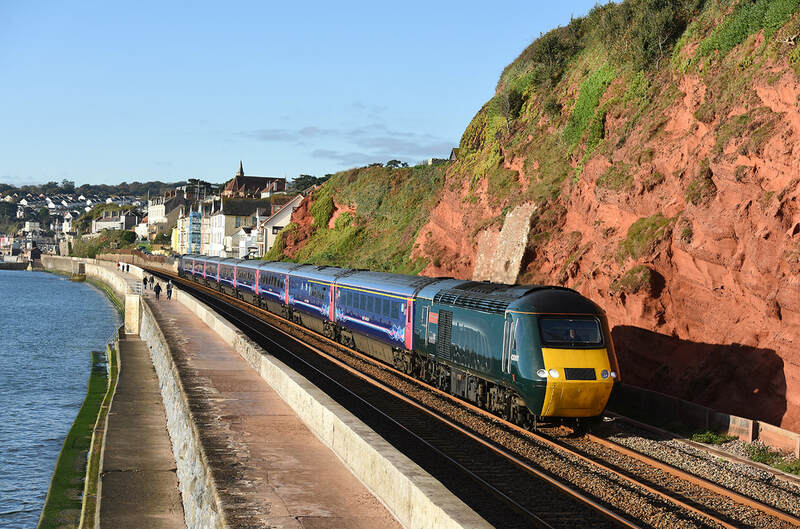 Looks like the day of the short HST at Dawlish on 11 October 2017. First we had a pair of PCs, then at dusk we had 43086, a TS and 43078 form train 5Z77, the 14.00 Old Oak Common to Laira. 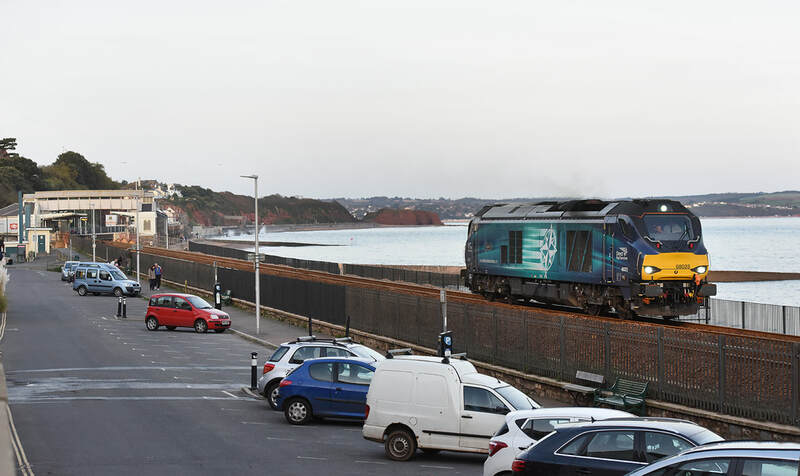 Using very high ISO, the train was captured passing along the Dawlish coast approaching Kennaway Tunnel. GREAT stormy sky. 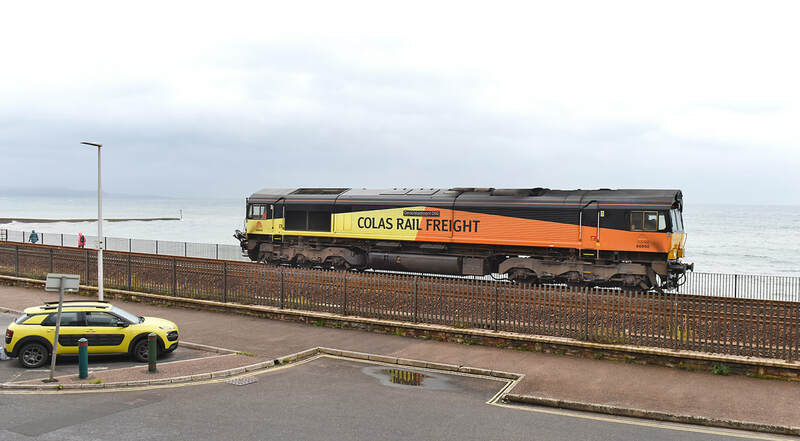 Colas Rail Freight Class 66 No. 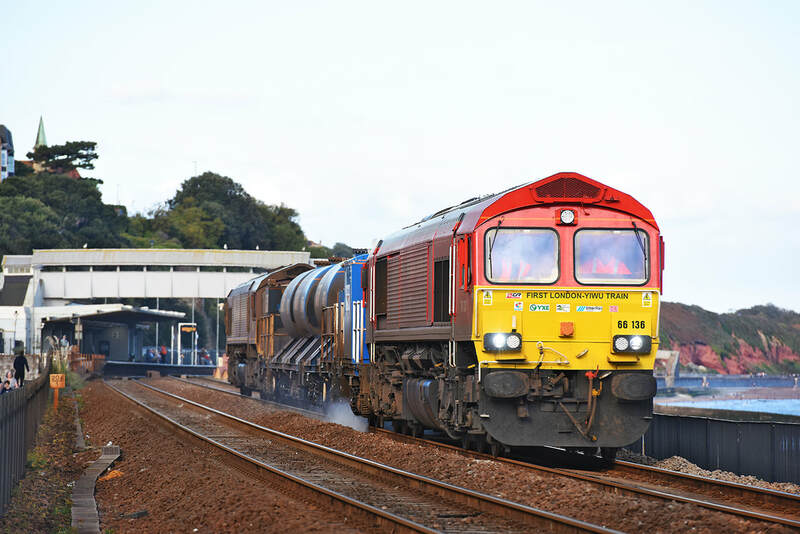 66850 passes Dawlish on 11 October 2017, running as 0Z66 13.01 Westbury to St Blazey depot. 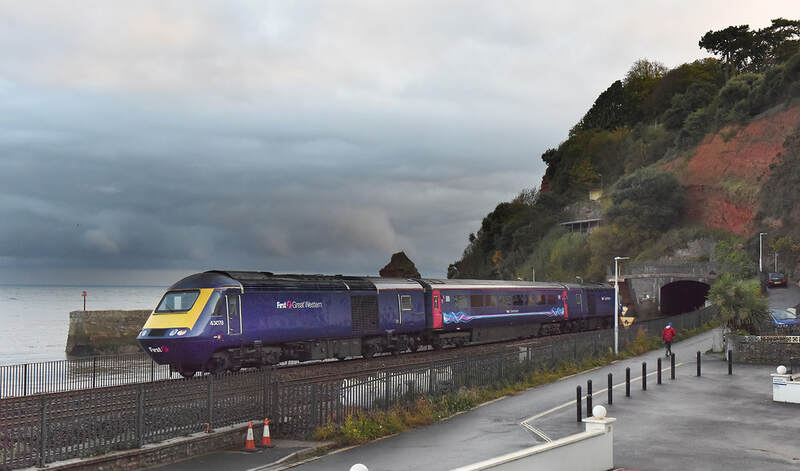 Well, three minutes before this pair arrived at Dawlish, the place was in full dull and spitting with rain! 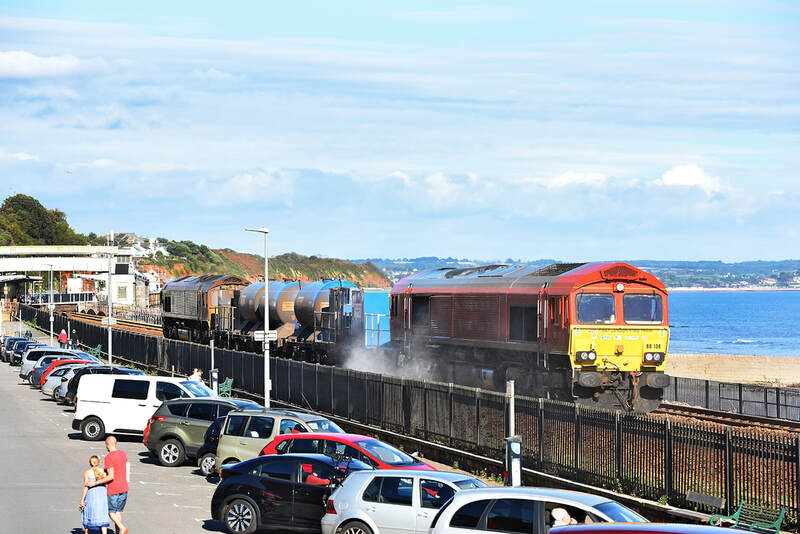 So with a good bit of sun luck, 43129 (ex paint shop) and 43197 pass Dawlish light power as 0Z70, 10.48 Laira to Old Oak Common on 11 October 2017. This years St Blazey out-based RHTT train formed of 66136 and 66027 with RHTT vehicles 642020 and 642035 made a pleasing day time run from St Blazey to Exeter and back to Penzance on Sunday 8 October 2017, the first time its worked over the sea wall this season spraying. Led by DB-C 'China' liveried No. 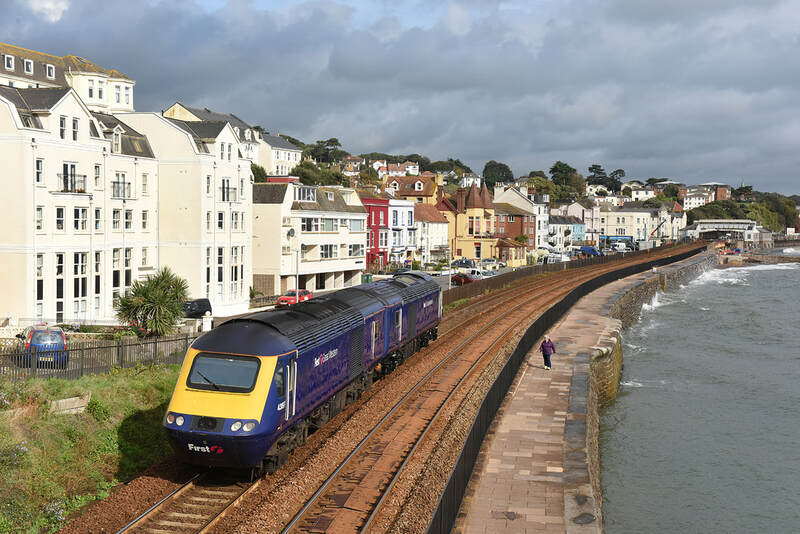 66136 the train is seen between Dawlish station and Kennaway Tunnel. This years St Blazey out-based RHTT train formed of 66136 and 66027 with RHTT vehicles 642020 and 642035 made a pleasing day time run from St Blazey to Exeter and back to Penzance on Sunday 8 October 2017, the first time its worked over the sea wall this season spraying. Led by EWS liveried No. 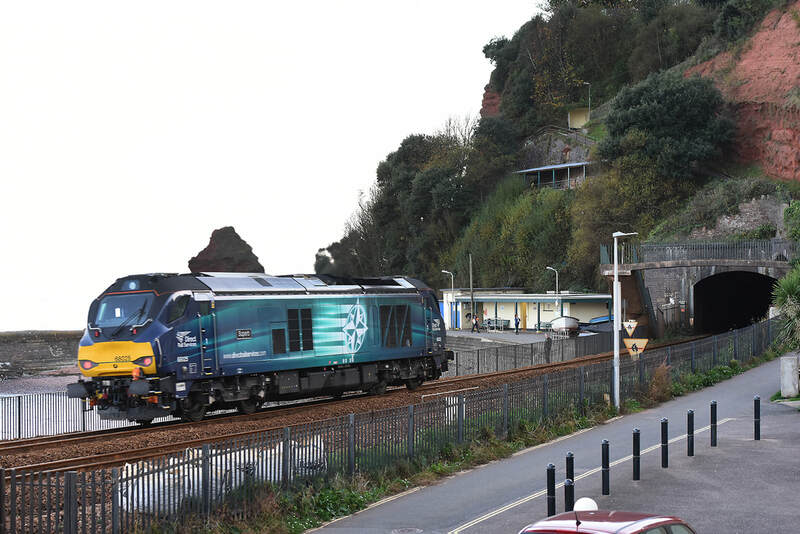 66027 the train is seen adjacent to Marine Parade heading towards Exeter. 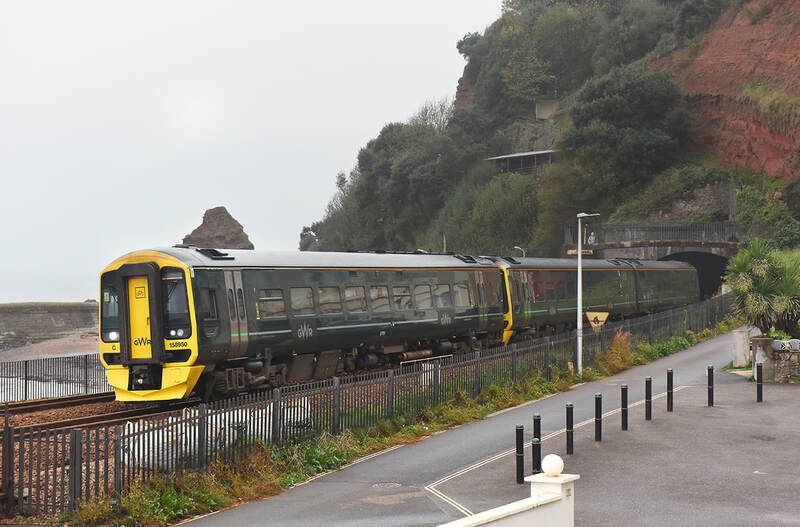 This years St Blazey out-based RHTT train formed of 66136 and 66027 with RHTT vehicles 642020 and 642035 made a pleasing day time run from St Blazey to Exeter and back to Penzance on Sunday 8 October 2017, the first time its worked over the sea wall this season spraying. Led by EWS liveried No. 66027 the train is seen emerging from Kennaway Tunnel. 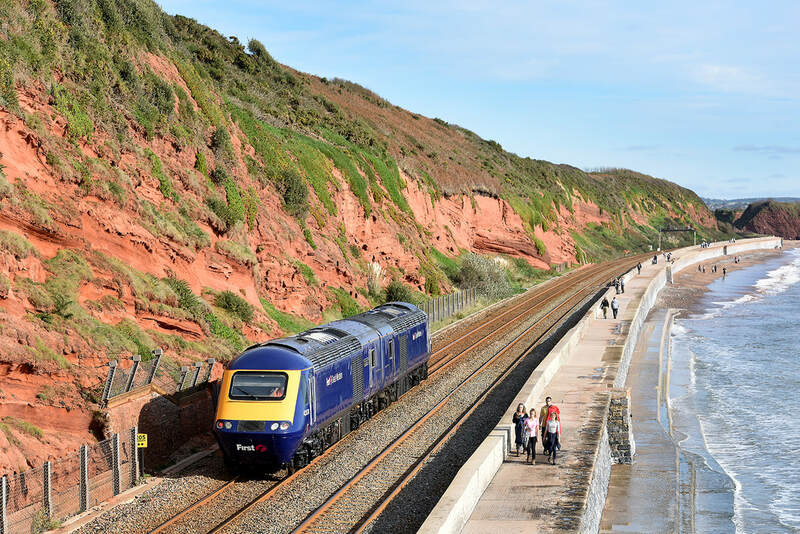 As is often the case on the Sunday morning, the first westbound train, 2T08, the 08.49 Exeter St Davids to Paignton is run over the bi-directional (up) line between Dawlish Warren and Teignmouth, to reset the barrow crossing indicator at Dawlish station after overnight engineering work.. That was the case on 8 October, when the train formed of Class 150/1 set No. 150127 heads towards Kennaway Tunnel, as local runner Roger Smith attempts to out sprint and sprinter. Freightliner Class 66 No. 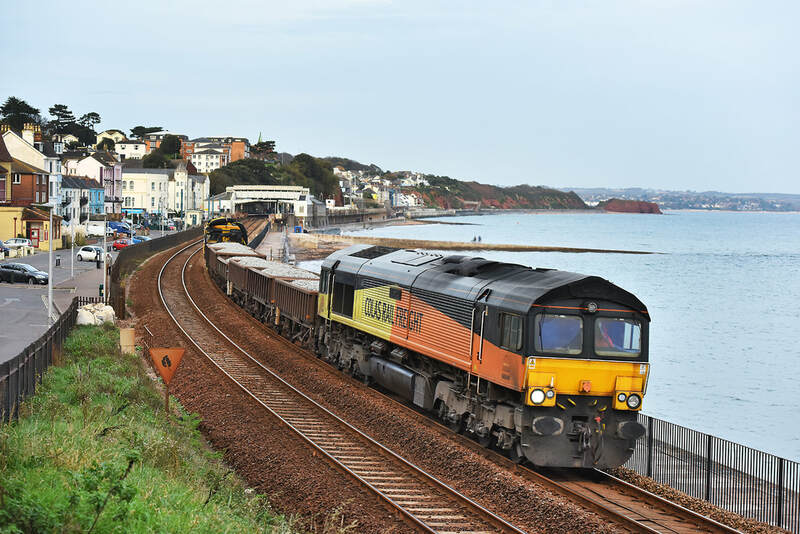 66967 on hire to Colas Rail Greight passes Dawlish on 5 October 2017 powering train 6Z77, the 08.55 Exeter Riverside to Exeter Riverwide via Fairwater and Par, Colas driver training run, the two RHTT vehicles 642039, 642014 are from the 2017 Gloucester train.